My review of the Labeled installation, an exhibition of mine that occurred over ten years ago, is to investigate the contexts as beginning stages of my interest in work culture. This installation was formed by my own employment experience. After the exhibit I placed the idea in storage then pursued other materials and processes to represent my artwork over the years. The actual Labeled artwork from the installation is no longer in storage. The uniforms were affected by water damage and no longer exist. My review is carried out by the slides and other saved articles from the exhibit. In 1999, I presented an installation entitled Labeled at the Center for the Creative Arts in Yorklyn, Delaware USA. 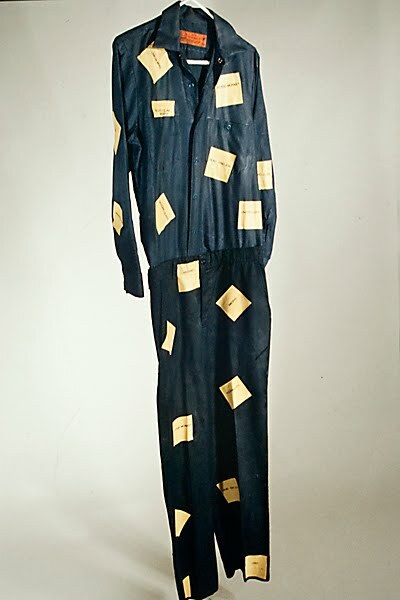 The artwork consisted of found clothing (uniforms) and screenprinted yellow “Post-It” notes with stereotypical names that tend to be negatively used towards these types of employment. Some examples of the words are low class, lazy, and unintelligent. The uniforms were stiffened and hung from the ceiling to allow visitors to walk around them. The selected uniforms were chosen by how distinctive they could be associated with a style of employment, such as a housekeeping position dress, a dark blue polyester shirt and pants, and aprons from retail and food service industry. During the opening, visitors were greeted at the door and labeled with a yellow “Post-It” note with one of the stereotypical names printed on it. This was intended to integrate the person within the installation. In the gallery space an audio of a short personal narrative was the background sound for the installation. These narratives were not about work experience, but personal experiences. A sample from several of the narratives is, “He didn’t expect to have this kind of job; his dreams were with the music business. His mother’s failing health needed attention first. Since he was the only one left to help her, this was the plan for his life for awhile.” The personal narrative was to influence a human element that is beyond the visual presences of the work uniforms service related ideals. To construct these narratives I borrowed from my different employment experiences with other employees who would express their own personal experiences to me. Reflecting on the exhibit I realized there are very few times I used found objects in my artwork. The uniforms and stereotypical names could have been taken further, for example to include other employment apparel such as office related. This would have produced an interesting balance between the diverse work cultures. The act of interviewing actual people with these types of employment and presenting their narratives and uniforms instead of found uniforms from a charity shop can utilize my interest in material culture methodologies. My intent in reviewing the Labeled installation is not to reproduce the artwork, but to consider future possibilities of what can be explored from the event of creating artwork and exhibiting it. The limitation of the installation is the visual representation that the uniforms portray, disregarding any personal effects of an employee. This aspect is already widely known. My interest in work culture needs to reach beyond the scope of singular ideas of employment roles.